Are you an event coordinator who is tired of the same old events? Here's a new way to entertain guests and give them something of value! We've been providing mobile shoe shine service for corporations for over 10 years. We provide everything needed for service including plush shoe shine chairs, all polish and supplies and we can even take pictures for your guests while being pampered! we guarantee that your guests will love our service or we will give you a refund. Take a look at how our services can make your next event a hit. 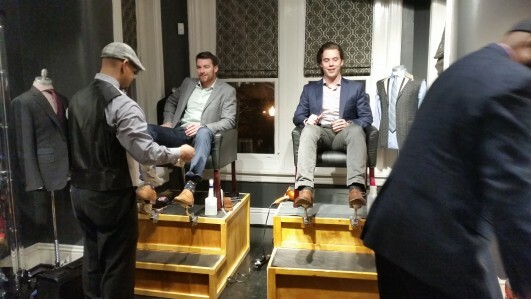 Union Station Shoe Shine Services allow you to keep your guest comfortable, stable and also gives them a value added service to their visit. "We highly recommend his services. He was perfect!" "Dave provided the shine services for a men's pampering suite we set-up for a vip group prior to their awards dinner. He did a GREAT job. In the planning stage, he was easy to work with. On-site, he was professional and friendly. We highly recommend his services. He was perfect!" friendship will always be remembered. You guys will never be forgotten!"